The most ndt-examinations are carried out at welds. The types of defects and their possible positions into the weld region are described in standards, codes and other rules. Influences coming from the different geometry and surface conditions can be neglected in some cases only by the skill of the operator. Therefore weld inspection is often accompanied by the separation between geometrical indications and indications from defects like cracks, especially if the cracks are starting in the root area with surface structures as welded. On the other hand a high probability of detection (POD) of small cracks is required. This requirement needs sensitive techniques like the 45° shear wave technique using the corner effect. The question after defect detection is to find a suitable method for defect sizing. 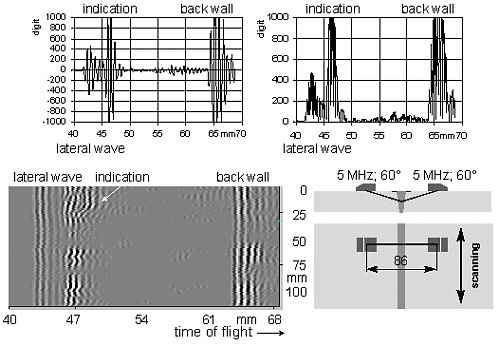 Methods based on the reflected amplitude are strong influenced by the defect type, by the orientation related to the sound propagation, by the frequency and by others. In opposite to these methods are techniques are known which are based on the diffracted amplitude. For such diffraction techniques the acoustic conditions on the defect borders are very important. Diffracted signals are mostly weak and the signal to noise ratio too. This is a drawback for defect sizing but for defect detection out of discussion because reliable defect detection is the assumption for a safe component and the for protection against emergency. However, one method, the Time Of Flight Diffraction technique (TOFD), is now discussed for defect detection at welds [1-3] as for instance surface breaking cracks, lack of fusion, lack of penetration, slag inclusions and porosity. The principle of those technique is well known since more then twenty years, but for an other aim, namely for defect sizing only [3-6]. Nevertheless, in national standards and regulations and even in a new European draft standard  the potential of the TOFD technique for flaw detection is described and sometimes required in guide lines and technical papers of manufacturers. Anyway in  some applications of the TOFD-technique are discussed also under the background to replace the X-ray technique. This and other optimistic statements were the reason for experiments carried out at weld specimens with the TOFD arrangement. In the present contribution the results obtained at different deep notches and cracks are presented. The main task of the examinations was the comparison of the detectability of surface breaking cracks using 45° shear wave technique and the TOFD approach. Specimens for the experiments were carbon steel plates and welds. The planar plates were used for the optimisation of the technique itself, the welded specimens for the evaluation of the potential for defect detection. Results received at 6 carbon steel plates with notches of different depth and inclinations are shown in fig.1. The typical TOFD pattern is presented in the B-scan, where 64 grey scale levels were used. The 6 test specimens were squeezed together and the measurement arrangement were carried out as shown schematically in the drawing. The scanning direction was perpendicular to the plane of the drawing. At the upper part of the present B-scan image, measured at 10 mm deep notches with different inclinations, the upper and lower tip indication is very clearly recognisable. For the demonstration of the separation between upper and lower tip indication, a typical A-scan from this area is plotted too. In the lower part of the B-scan the results at 5 mm deep notches are shown. A separation between the two tip indications is only given if the notch is perpendicular oriented to the coupling surface, but this information comes out when the A-scans are evaluated. This is demonstrated in fig. 2 where two A-scans are presented, the RF-A-scan and the rectified A-scan. A separation between the upper tip indication and the back wall indication at the RF-A-scan is also difficult respective nearly impossible. Much better in this specific case is the evaluation of the rectified A-scan as shown in the figure. The defect situation at the welded test specimens is shown in the macro-graphs of fig.3. In the middle of the macro-graph on the left hand side a crack like defect (lack of root penetration) is shown. The macro-graph on the right hand shows four planar defects two in the root area (surface breaking cracks) and two in the middle of the wall thickness (lack of side wall fusion). The test specimen with the crack like defects in the root area was the important one for the experiments in relation to the main aim of the present contribution i.e. 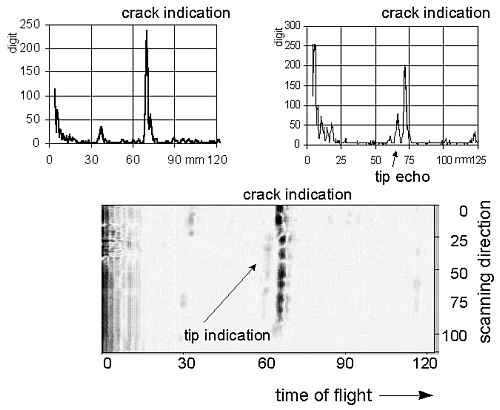 the detection of surface braking cracks at the opposite surface. The result received at the test specimen with the inner wall defect (lack of root penetration) is shown in fig. 4 together with a typical A-scan. The defect was well detected but an estimation of the defect size was impossible because a separation between upper and lower tip indication is not given, as demonstrated in the B-scan and A-scan. According to the pre European standard, the examination of a wall thickness of about 50 mm requires one probe distance but we had measured with two probe distances, one optimised for the middle of the wall and the other for the root area. Fig. 6 shows the A-scans and the B-scan of the results, measured with a probe index distance of 86 mm. For the documentation of the probe arrangement a scheme is also presented. 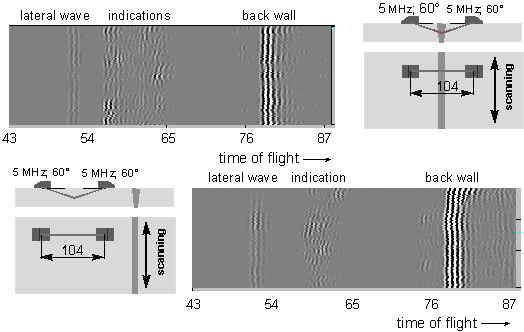 The indication from the lateral wave as well as from the back wall is very clearly to see. Between these two indications an other more or less irregular shaped indication is visible. It seems that this indication was produced by the lack of side wall fusion as shown in the macro-graph of fig.3. An evaluation of this indication delivers a defect depth position of about 10 mm. If this position is compared with the macro-graph of fig. 3, a lack in the depth position of about 5 mm is obviously. 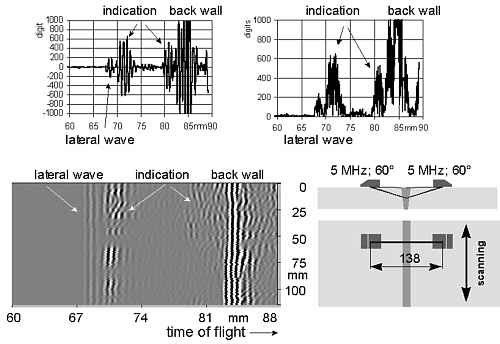 The reason for this inaccuracy could be the fact, that two defects - of each side of the weld - are present and due to interference's of the ultrasound the measured time of flight of the pulse is not identical with the diffracted sound pulse at the defects. However the measured results give clearly information about a defected area in a depth position not so far away from the coupling surface, but no information about the defect depth extension. Also with high damped ultrasonic probes a depth evaluation was impossible. Further information about the existing crack like defects in the root area were not recognised during the evaluation of these results with a probe index point distance of 86 mm. With a distance of 138 mm as shown in fig. 7, indications in the root are - close to the back wall indication - are visible at the B-scan as well as at the A-scans. The evaluation delivers a crack depth of approximately 11mm, which is close to the depth extension measured in the macro-graph in fig. 3. The signal to noise ratio is sufficient for the evaluation. The length extension of the root defect was estimated to 75 mm. 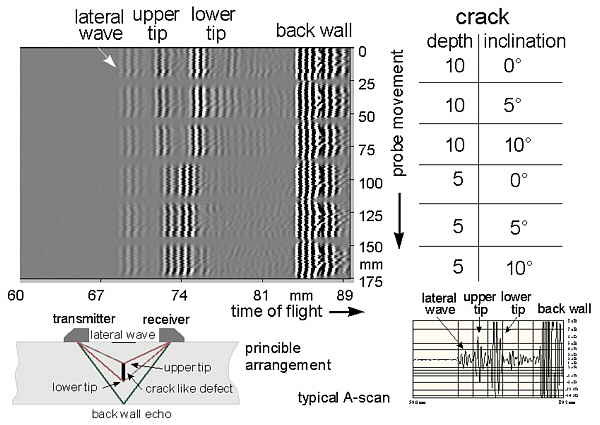 The potential for crack detection at the opposite surface using the 45° shear wave technique is with regard to the signal to noise ratio much higher than with the TOFD technique. Also diffracted waves at the tip of the crack can be evaluated if the signal to noise ratio is great enough, so the same evaluation procedure as for the TOFD technique is usable for defect sizing. The advantage of the TOFD technique, a high potential for defect detection and defect sizing, as mentioned in the literature [8,9], couldn't be confirmed during the experiments at test specimens with surface breaking cracks on the opposite surface. This statement is only related to the detectability of such kind of defects. If other influences must be considered e.g. the separation of defects from geometrical indications or other ambiguous indications, the skill of the operator is the most important parameter for an accurate and reliable evaluation of the results. This is of course, valid for both of the techniques. But anyway, using the 45° shear wave technique geometrical indications are mostly produced by the irregularly shaped root of the weld. At the TOFD technique such a clearly assignment where the indications are coming from, is sometimes difficult or impossible as demonstrated in fig. 9. On the top the B-scan, measured in the weld region, is presented and in below the B-scan measured at the base material. Comparing these two images it is obviously that in the same depth area indications are visible independent whether the measurements were carried out either at the base material or at the weld area. An evaluation is therefore very difficult also if high skilled operators are responsible for the evaluation. For components with a high safety factor like components in the nuclear industry, components in the chemical industry with a risk for the environment or with a high safety risk for the human life, the used techniques have to regard these circumstances. Therefore our recommendation is, to use firstly inspection techniques which will give clearly information about the integrity of the component i.e. techniques with a high probability for defect detection related to a high signal to noise ratio and secondly sizing techniques. A comparison of the results received with sizing techniques and results measured on macro-graphs are presented in fig. 10. The Y axis is representing the crack depth, the X-axis is representing the circumferencial position of the crack marked with letters. The surface breaking crack was detected in the weld area of a thick wall pressure vessel. With regard to the results received with SAFT, the owner of the vessel decided the exchange of the vessel. The answer is left, what would have been when the results of the TOFD technique were the basis for the decision. The signal to noise ratio of the TOFD technique is, as well known, very poor. The evaluation of patterns with amplitudes close to the noise level therefore is necessary. Using the 45°-technique the signal to noise ratio is high enough. An evaluation based on the amplitude is mostly easy, but one drawback should be mentioned in this summary, that is the amplitude saturation of cracks with bigger depth extension. If the sizing potential of both techniques is discussed, the TOFD approach has some advantage but anyway, if a tip reflection is detectable a sizing with the 45° shear wave technique is also possible. An other important point at the weld inspection with ultrasound is the separation between geometrical or "ghost" indications from defect indications. For the time being this point is not optimised using the TOFD-technique. Therefore an application of this technique for the detection of surface breaking cracks on the opposite surface should not be considered because more experiences are necessary. Our recommendation is, withdraw the prENV 583-6 standard until the open questions are answered satisfactory.